Does the soft compound, thick tread blocks, and high number of deep sipes used in a snow/ice tire affect how much torque/power a roller chassis dyno would measure? Yes. Winter tires lower the power output as measured by the dyno. The key being power being measured by the dyno. 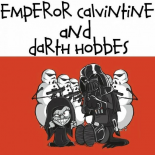 The engine, in both cases, is generating the same power. The tires used in this comparison are from the opposite ends of the spectrum; one is designed for ice and snow while the other is for Tarmac. From the pictures below, one could imagine the difference in tread deformation when the tire is stressed. In relation to the test results, I would expect winter tires that uses shorter blocks and fewer sipes to experience less loss than the WS-70 and All-Season tires will likely have more loss than the RE-01R. Chassis dyno used in the test is a Dyno Dynamics 450DS AWD unit. 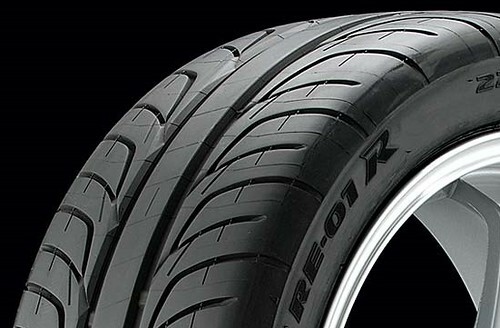 Aurora W403 tires (non studded) has few sipes and tread compound feels harder as well. Why are the tires pumped up to 45psi vs what the manufacturer recommends? Interesting info Sunny. 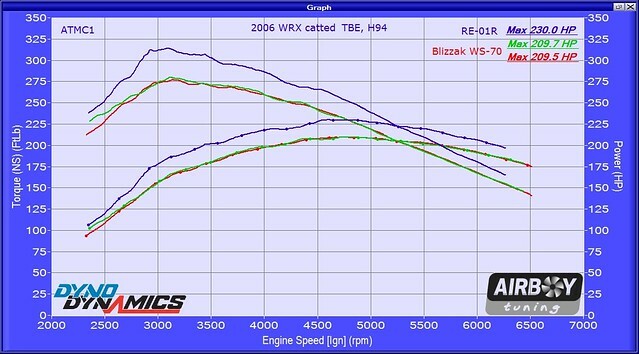 Reading the complete article on your site the dyno "misreads" road speed with the Blizzaks. What do you attribute this to? I can see a soft tread block affecting initial acceleration but it doesn't make sense to me that it would have a long term effect. It is part of the operation procedure for the dyno. Also, "required" tire pressure depends on the loading and speed of operation. There are three recommended settings on the door sticker of our Saab 93. Higher pressure for more passengers and/or higher speed. The road speed reading is accurate as that is derived from the dyno roller speed. The engine RPM readings are based on the coil pack signal so that should be accurate. *If* the tires are not slipping, then the only thing that I can think of is tire deformation, giving a smaller effective diameter and hence lower road speed for a given engine speed. Sunny, I was surprised to learn how much lighter the snows are than your RE-01R's. Well given this new information I am going to tack on an additional 30whp and wtq to my S4 dyno numbers....hope that's okay with you Sunny! What tires do you have? I'm not sure if these results apply to all snow tires to the same degree, but I'd imagine every tire fits somewhere on a spectrum. After my initial dyno I took a close look at my tires and was shocked how easily I could deform the tread block with some light pressure. I was talking to Clark (Road Runner) this morning regarding this and we came up with the same idea. Given roller speed and RPM are "constants"/accurate then there must be deformation in the tire which make them effectively "smaller". This deformation becomes less as speed increases due to centrifugal force causing the RPM/speed plot to start to come back into line at higher wheel rotational speeds. This can be caused by rubber compound, tread construction (as you pointed out) and sidewall stiffness. 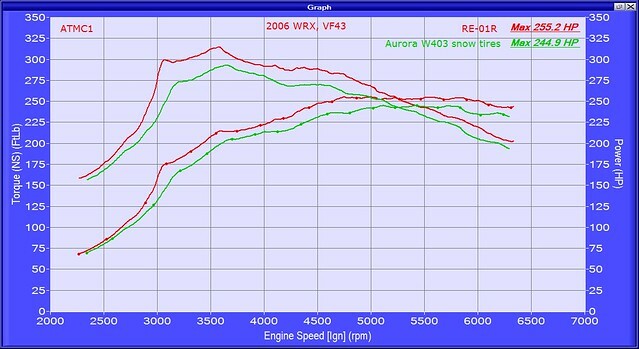 Do you check the linearity of the speed/rpm plot with every car put on the dyno? Do you still have the data from the Road Runner? I weighed the RE-01R+stock 06 wrx alloy and it came to ~46lb so, 26lb for the tire is reasonable. Not usually, especially with manual transmissions. The large delta in results in this test had me pawing through whatever data the dyno computer had collected, as a "sanity check". The data for the Road Runner is in the dyno data base. I remember checking that while the car was on the dyno to see what the slope is like. The torque converter in the automatic messes things up a bit as well. Maybe someone can check the math but last night I tried to estimate what it means to have the tires "absorb" 20hp over ~10seconds and came up with ~4*C increase in tire temperature, assuming ~5kg for the tire material around the perimeter. This is very interesting indeed. I had wondered about this when Sunny had my car on the Dyno in the late fall. It makes complete sense that the tires would have more deformation with a softer compound. Sunny had performed around a dozen pulls that afternoon and my winter tires lost a good 1/32 of there tread and left it on his workshop floor. I had chalked this up to the roller ridges and the out of temperature operating range, however the deformation is most likely the main culprit. I'd be interested to find out what numbers would be put down with stock tires. 4stair, sounds like you were having pure slippage and likely a component of deformation as well. The "slippage" in my case was slightly different, as Sunny said there was zero rubber on the dyno, or the floor during this dyno session, or the previous one. I took a close look during the first session because I was curious about any tire wear on the winters, I was very surprised not to see ANY rubber. What really inspired me to want to run with this test was realizing how soft the tread blocks were, even at todays temp I can basically push the sipes over on their sides with relatively light pressure. The slippage with my tires was resultant of the sipes opening up and then the tread block would "lurch" forward as they closed. I understand this is a horrible explanation, I can picture the process in my head. Maybe Sunny can explain it more effectively. Out of curiosity what tires did you run with? 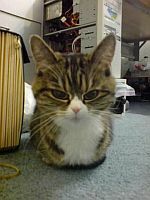 I think I'm understanding your slippage explanation. Now would this slippage be based on compound and tread pattern of the tire alone, or would there be any other factors? 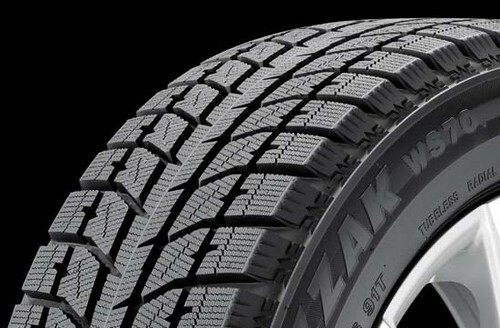 The tires are stock sized Kuhmo KW-27. V speed rated and where inflated to 40 psi I believe. At least those factors I'd imagine, there must be others as well. Another thing I noticed was that the load roller's grooves were spaced similarly to the sipes, not sure if this helped to magnify the effect. These were problems we encountered with our MustangMD250 twin roller before we bought our AWD dyno. Being that a dyno only really has 3 variable measurements and the rest of the data is all math related one being roller speed one time and the other comes from the load cell. I tried a variety of formulas to try and balance everything out and never could exactly get it right. All the formula's could not account for the variance as there is just too many to be accurate with. The first thing was repeatability when you strap the car down the load had to be the same so we would baseline a car then install one of our prototype parts we were working on and either had ridiculous low or high numbers as a change. So I tightened up the research making sure the air temp, oil temp, trans oil temp and coolant was the same. We had a 16 channel data collector and was even having trouble with that getting everything the same but at least that was doable. We found it was how tight the car was strapped down each time now this isn't a big deal for a standard tune but we were taking the car on and off to install parts (one of the new reasons the new shop has a pit under the dyno) and wanted to see 1 or 2 whp gains to know if we were on the right track with the variance being as much as 15 whp solely based on how hard the car is strapped down we started placing measuring tabs on various points of the cars so we could tighten the straps to a set measurement. The next variable was tire grow or in the case of really high whp stufff tire slip. Tire grow I could never ever really solve for R&D except by checking tire pressure each run which I found to be a real pain. Depending on the temp of the dyno cell will also determine grow rate as well so I don't think you can implement a formula to cover all angles and if you do you a merely doing a good guess. 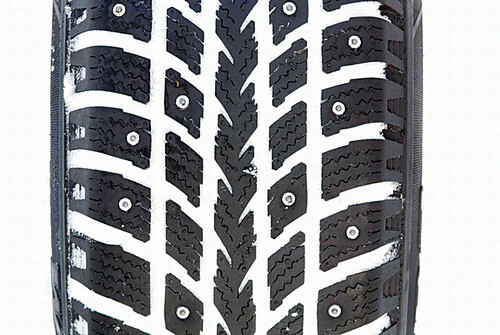 I could see how tire deflection of a snow tire could really mess you around as well as the tendency to want to walk around on rollers as well. The other thing was tire weight I could never really do compares from one vehicle to the next as weight of tires gave another inconsistency. For tuning it doesn't really matter though you really are only looking for gains or losses so comparing from one vehicle to the next is merely for information but doesn't affect your end product. For me with the R&D I am doing it really was an issue and as much of a pain as it is taking wheels on and off (especially when people forget their wheel lock key) I found the setup time comparable for repeatable numbers. I also found the inertia of the wheels hid holes in the table. Sunny I still have some of those tabs I made for strapping down vehicles and measuring the load I would send them to you if you want to see what I did. I would be happy to share some of the formulas we found with oil temp, air temp and cooling temp and transmission oil temp especially for Subaru if you want. After 15,000 hours of dyno tuning I got a few things that would probably help you. You know my number give me a shout. Congrats on the new dyno by the way. Updated 1st post with a 2nd set of results. Whats the difference in circumference between the 2 tires? Seeing how any change in that is also going to directly affect the final gear ratio. The tire size is very close, within a couple of %, based on the RPM vs speed data. Between the first and last set of tires you are basically 4% out. Overlay the boost curve recorded for each run that could be one of the issues as well.